Help us continue our mission of sustaining Stephen Foster’s legacy and bringing quality entertainment to Bardstown by donating to our Sound System Fundraiser below. Just click on the PayPal logo and you’ll be taken to a secure donation page. No matter the size, your gift is truly appreciated. Donate securely using PayPal or your favorite major credit or debit card. Funds donated through PayPal go directly to The Stephen Foster Drama Association and will be used for the purposes of purchasing a new sound system to be used for the upcoming 2019 season in June. On December 21, 2017, the amphitheater was abruptly closed by the Commonwealth of Kentucky. Thanks to the dedication and generosity of our community, we were able to make the necessary structural and electrical repairs in order to temporarily occupy the amphitheater for the 2018 Season. In accordance with the State’s requirements, in September the stage area will be torn down and rebuilt. 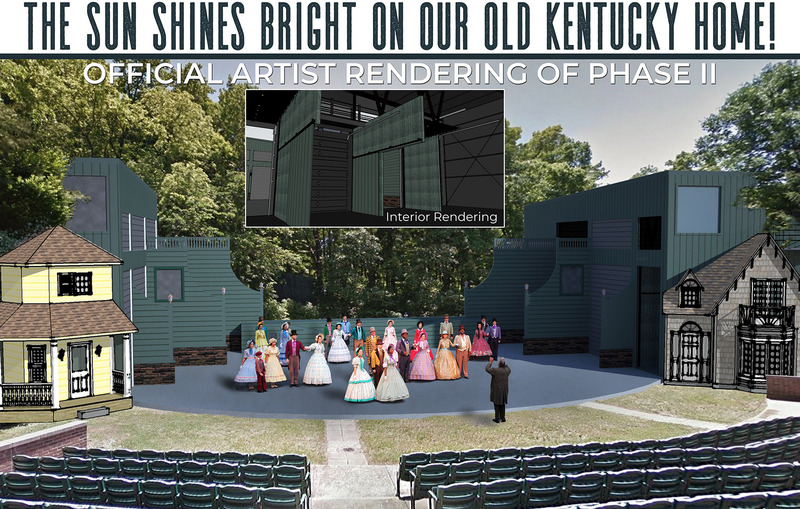 This rendering is the current depiction of what the new stage area will look like – essentially the same, but with many improvements “behind the scenes” and with construction materials that will better withstand weather elements and time. One of our greatest attributes is that we provide an experience that can be shared by friends and family of all ages – a rare opportunity. We intend to preserve the amphitheater experience in such a way that you can return years later and the memories of your first visit will rush back – to be shared with the next generation.